It has been almost a month since I posted an update about Curiosity and here am I! Sit down, because I have a lot of material for you to chew on. Last time our beauty Curiosity arrived at the Kimberley site where she plans to investigate and to execute a drilling campaign. The Kimberley is a spot of well-exposed outcrops that were identified many months ago from orbit and Curiosity was guided to this site for many many months. This is the best science stop for Curiosity on its way to Mt. Sharp. You can also appreciate this route map better, if you see it in stereo with red/blue glasses. Remember, the red is on the left eye! So, that’s good – we have hills/buttes, we have different terrains, but what does that really mean and how is this similar/different from the Yellowknife Bay where Curiosity drilled for a first time more than a year ago? The image on the left shows the Yellowknife Bay. The red arrow points to a scarp, that is the contact between the lower Sheepbed mudstone and the Gillespie sandstone above it. The blue arrow points to another scarp that is the border line between the Gillespie Unit and the Glenelg Unit. A similar set of scarps appear at the Kimberley, on the right. The purple arrow points to a border between the lowermost Striated Unit and the middle bedded unit. The yellow arrow marks the contact between the middle bedded unit and the uppermost hummocky material. At Yellowknife Bay, the science team at JPL found out evidence that the lowermost Sheepbed Unit was exposed to the environment relatively recently – around 48-108 millions of years (that is a fairly recent time for a geologist). This happened by a process of a scarp retreat, which essentially means that the rocks above eroded over time (due to wind erosion). If you want to find the best place to look for organics on Mars, you need to go places like this Sheepbed Unit where the mud-stone has been exposed relatively recently to the harsh Martian environment. The science team sees good scarp retreats at the Kimberley too. This is why Kimberley is a good science stop for Curiosity and this site was seen months ahead. 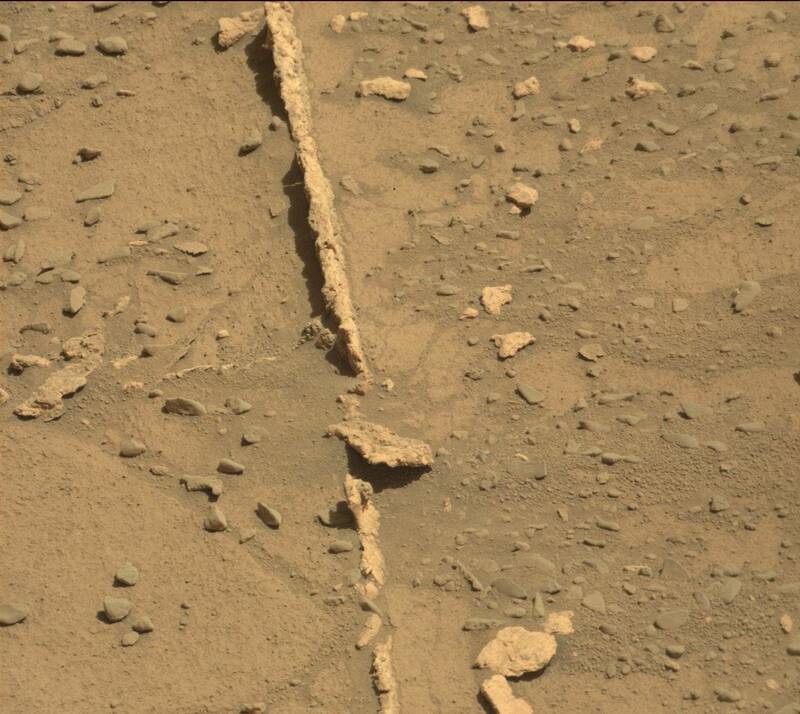 Now, it turns out that the rocks at the Kimberley are not mud-stone (according to a recent JPL release), which is unfortunate, but there is still a scarp retreat here. Why is finding sandstones worse than a mud-stone? Because a mud-stone is the better material for preserving organic materials. On the other hand, at Kimberley and around it, the rover see different types of sandstone, some of which erode faster than others. This is probably because the material that cements the grains of sands together is different and the science team wants to know exactly what is it! So, enough science mumbling, let’s get to the images. I will be showing you a lot of images that I prepared for you. While you watch them, look at the note on which Sol they were taken by Curiosity and you can have a look at the Route Map above to see where was the rover when she took the image. 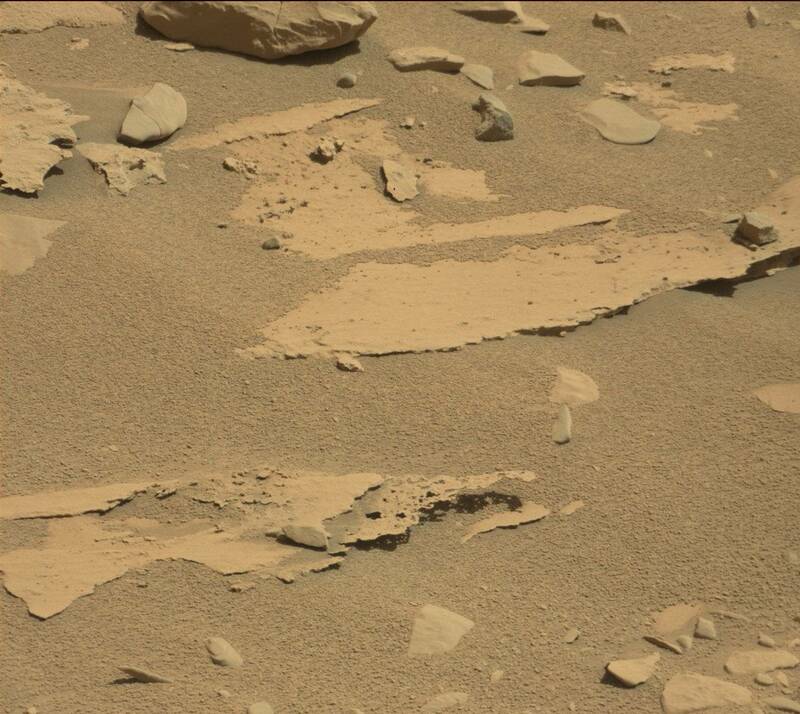 On Sol 588, Curiosity did a Mastcam imaging of several outcrops and ~45m drive around the eastern part of Kimberley. Another successful drive on Sol 588 (April 2), so another drive is planned for Sol 589 after Mastcam and ChemCam observations of a soil target named Chirup. If the ~30-meter drive goes well, we should be in position to acquire lots of images of The Kimberley, the waypoint selected for thorough analysis using all of the instruments. Therefore, post-drive images are planned that will allow a big set of images to be accurately targeted. On this panorama image you can see the whole Kimberley site. North is on the right. 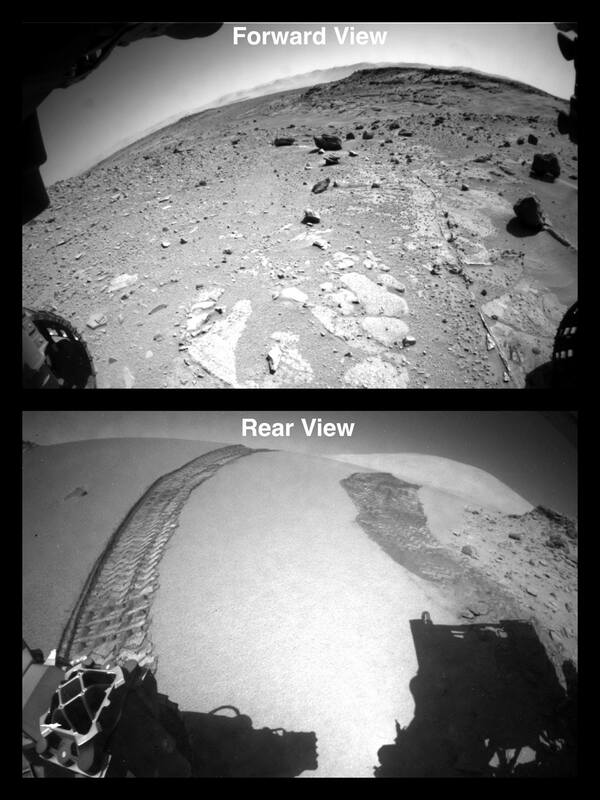 Let me take a side note here and explain a little bit about how Curiosity’s Mastcams work. I read this in my friend’s Emily Lakdawalla’s blog and I was so fascinated to understand why Mastcam images that the rover returns to Earth differ a little bit. First of all, if you visit the raw images sites you maybe noticed that the right-eye images are square and the left-eye images are wide rectangles. Why is that? When you look at Curiosity as if you will kiss her, she looks like o.O as if to tell you that it is not OK to do it. And it is understandable – she is a rover! So, let me explain – the right-eye camera has a smaller aperture. It is called Mastcam-R or Mastcam-100 and has a focal length of 100mm and a FOV of 5.1 degrees. The left-eye camera has a larger aperture and is called Mastcam-L or Mastcam-34. It has a FOV of 15 degrees – 3 times bigger! But both cameras have exactly the same detectors, which means that the M-100 takes images with a resolution 3 times larger than that of M-34, but it would take an array of 3×3 M-100 images to cover a single M-34 image. So, back to the question why some images are rectangles and some are squares! When the cameras take panoramic images simultaneously, it would be a great waste of bandwidth to send to Earth an entire M-34 (L) image for each corresponding M-100 (R) image, so they crop the M-34 (L) frames close to the coverage of the M-100 (R) image. It’s a little hard to predict where that is, because the two cameras don’t look equally straight ahead but are toed in by 2.5 degrees. You can predict the vertical position of the M-100 (R) frame within the M-34 (L) frame, because it doesn’t change, but you can’t predict the horizontal position without knowing the distance to the object shot. 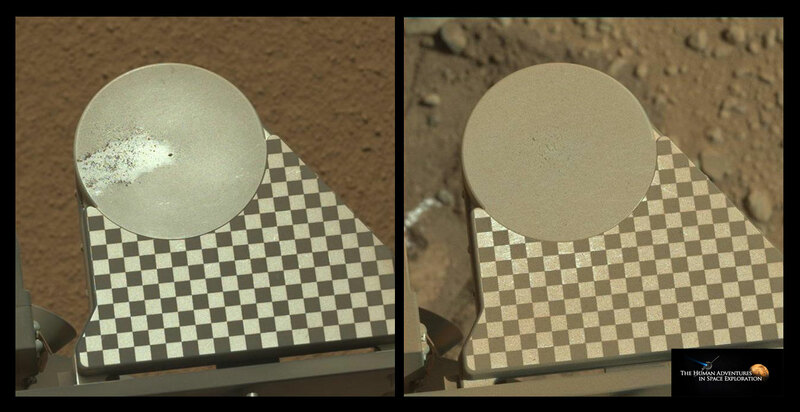 So, the Mastcam team can crop the top and bottom of each M-34 (L) image to save bandwidth and they leave the left and right sides uncropped and the image is rectangular. So, M-34 (L) images are rectangular, while M-100 (R) images are square. Now you have passed Curiosity’s eyes 101. Write me in the Contacts section to receive your certificate or to just say “hi” to me! So, let’s continue with our journey around Kimberley. 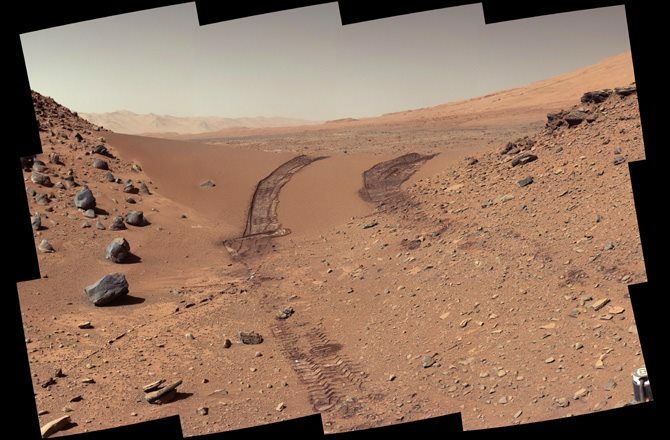 This is a panorama view taken at the end of Sol 593 drive. You can see the Striated Unit and the two northern buttes of Kimberley, as well as the rim of Gale Crater in the very distance. 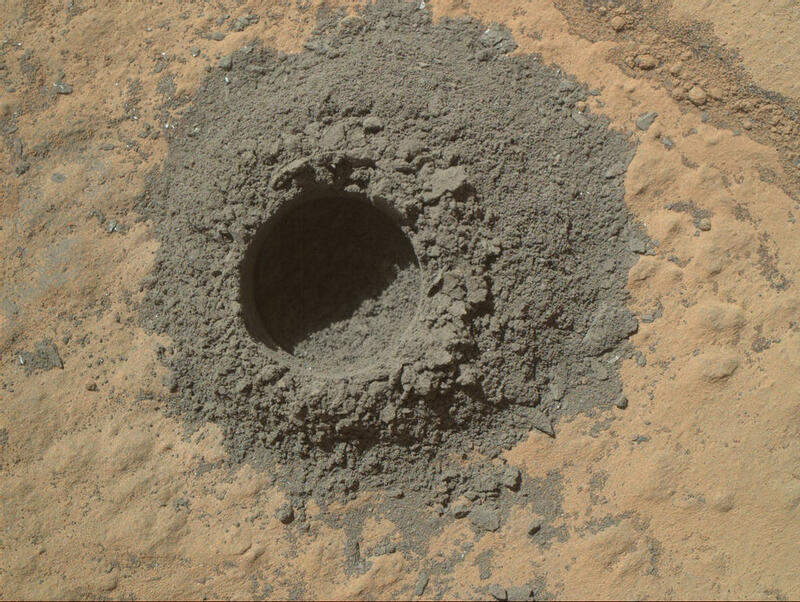 While passing by, Curiosity took a shot of an interesting hole in the ground in front of her and inspected it with MAHLI. 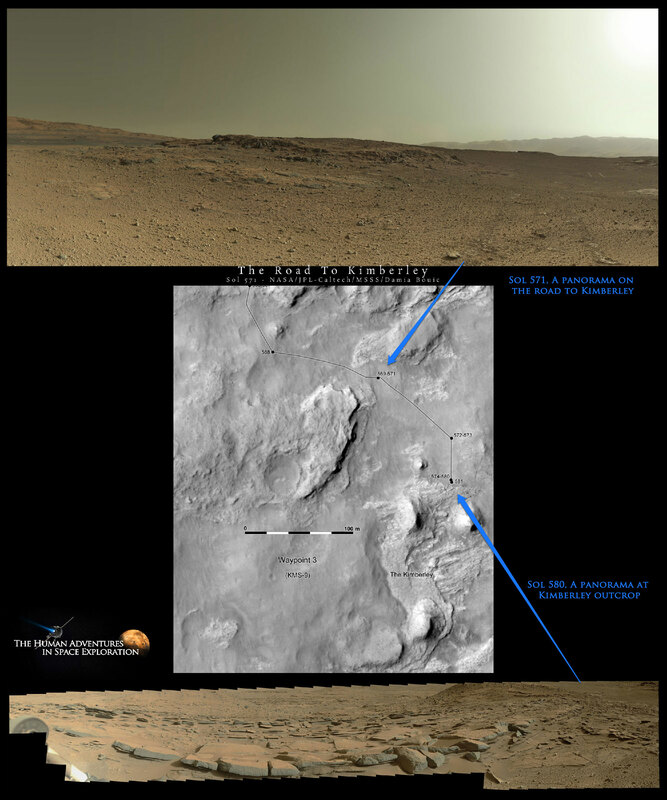 Here are several panoramas of the surroundings and the ground around Curiosity on Sol 592 and Sol 593 shot with M-34 (L). 7 April 2014The rover will stay put on Sol 594 and acquire lots of ChemCam and Mastcam data on interesting nearby rocks. I’m not scheduled in a tactical operations role today, but I’m following along because I’ll be MAHLI/MARDI uplink lead tomorrow. 8 April 2014Mars is at opposition today, so Mars will rise at sunset and be visible all night here on Earth. On Mars, Earth is not visible because it is too close to the Sun. The MSL Sol 595 plan is dominated by a drive along the edge of The Kimberley outcrop with Mastcam and Navcam stereo imaging at 4 locations along the way. 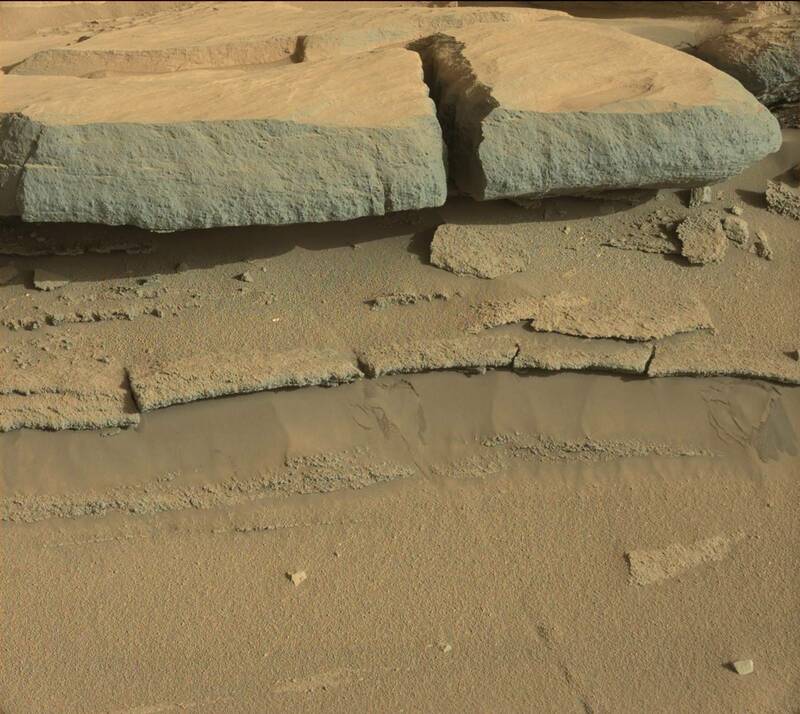 Lots more Mastcam images will be taken after the drive, to help plan our exploration of The Kimberley. It was an easy day for me as MAHLI/MARDI uplink lead, as only standard MAHLI wheel images, a stowed image, and a MARDI twilight image were planned. 10 April 2014The surface near the rover isn’t very interesting, so planning for Sol 596 focused on driving toward the outcrops up to 50 meters away. During the drive, the rover will stop and acquire DAN, Hazcam and MARDI data on the striated unit before moving on. So it was an only slightly busier day for me as MAHLI/MARDI uplink lead. After the drive, Navcam and Mastcam images will be taken to allow an approach to the outcrop on Sol 597. At the end of Sol 595, the team took a shot of the whole area with Mt Remarkable at the center to be able to make future planning. This panorama was shot with the Mastcam-100 (M-100 (R) ). Have a closer look at it, because it looks marvelous! 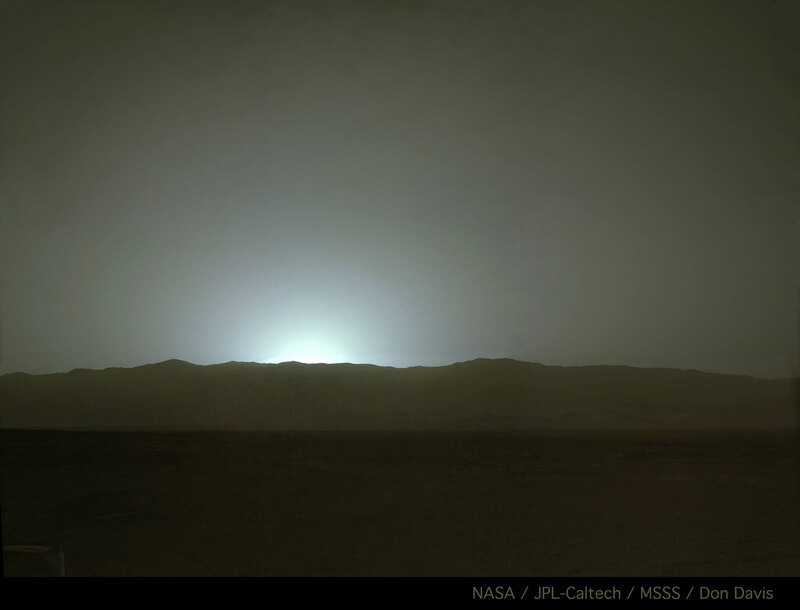 Curiosity has taken this marvelous sunset image over the western rim of Gale Crater on Sol 587. This is a very beautiful image and there is a lot of planning and execution behind it. 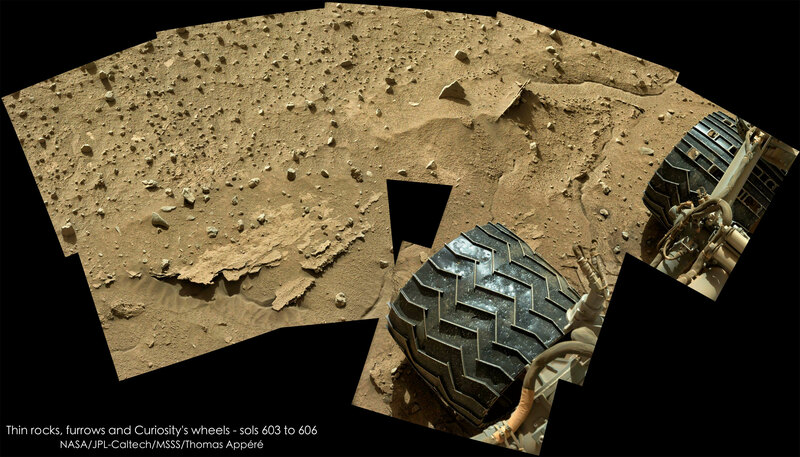 Images like this one have an incredible value for the public outrage of the Curiosity mission on Mars. Images like this one also have a scientific value for the atmospheric properties of Mars. I am very grateful to see the Curiosity mission planners put some effort into the aesthetics of the mission images. They carefully plan how to shoot panoramas not only to cover their scientific objectives, but also to include the proper frames, setup and to encompass enough horizon too, so that the image is more pleasing. And make no mistake, it takes a lot of planning to take a sunset photo on Mars with a 60 minutes delay! Just imagine it! 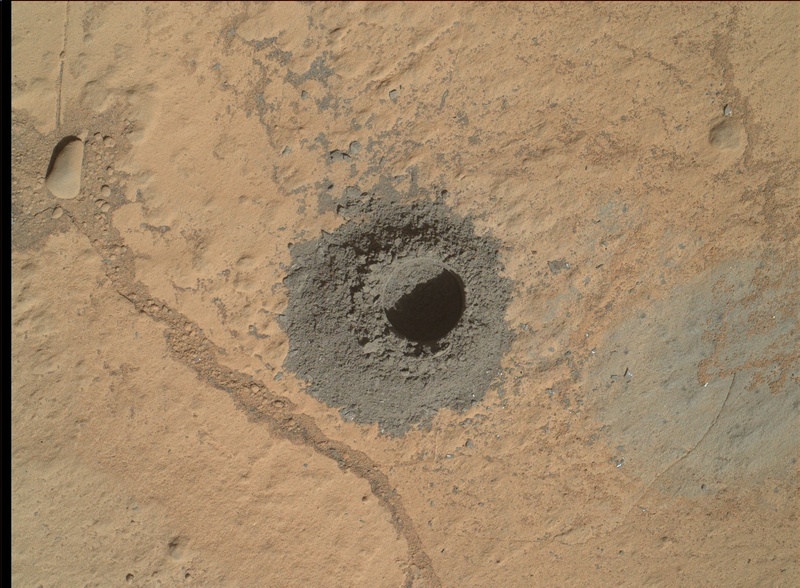 The science team at JPL picked a drill site for Curiosity to drill on. They approached the site on Sol 609 and began arm work on Sol 610. 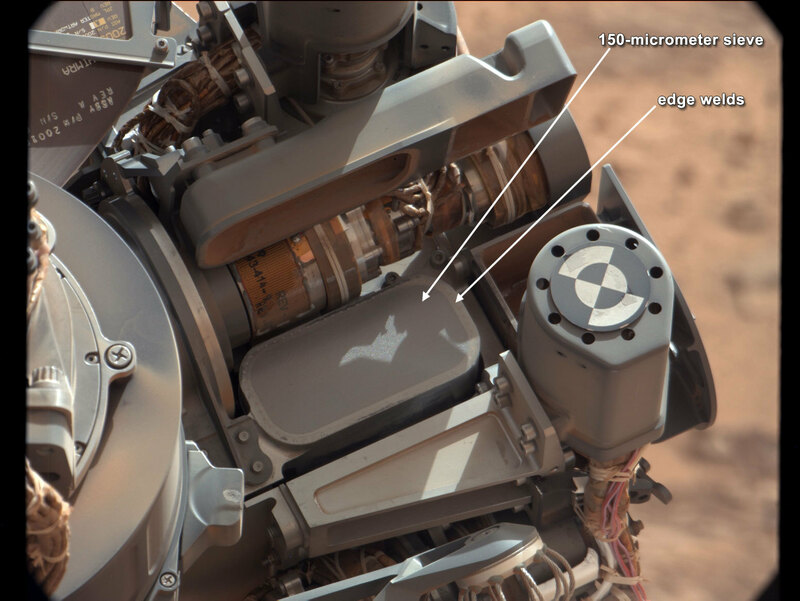 Before drilling on a rock, Curiosity takes MAHLI and APXS measurements of the site, then removes the dust off the rock, its going to drill on, with its Dust Removal Tool (DRT) and shoots with the ChemCam on the dust-free surface. 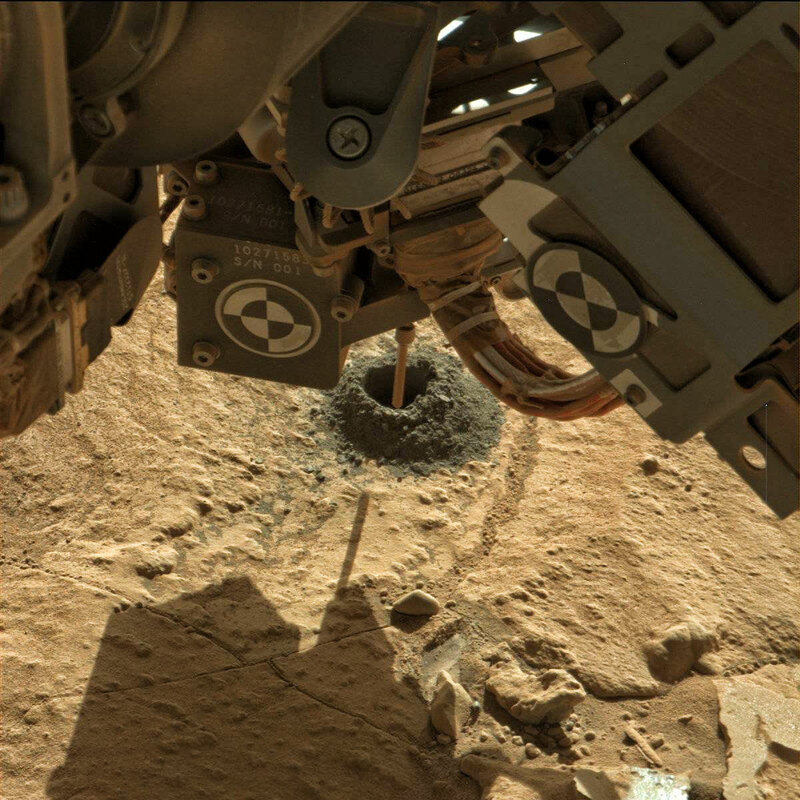 Then she makes a mini-drill hole to test the stability of the rover and if the rock material is good for drilling. If everything looks good, then she drills the 6.4cm deep drill hole. There were anomalies on Sol 598 -600, so activities resumed on Sol 601 to 603. 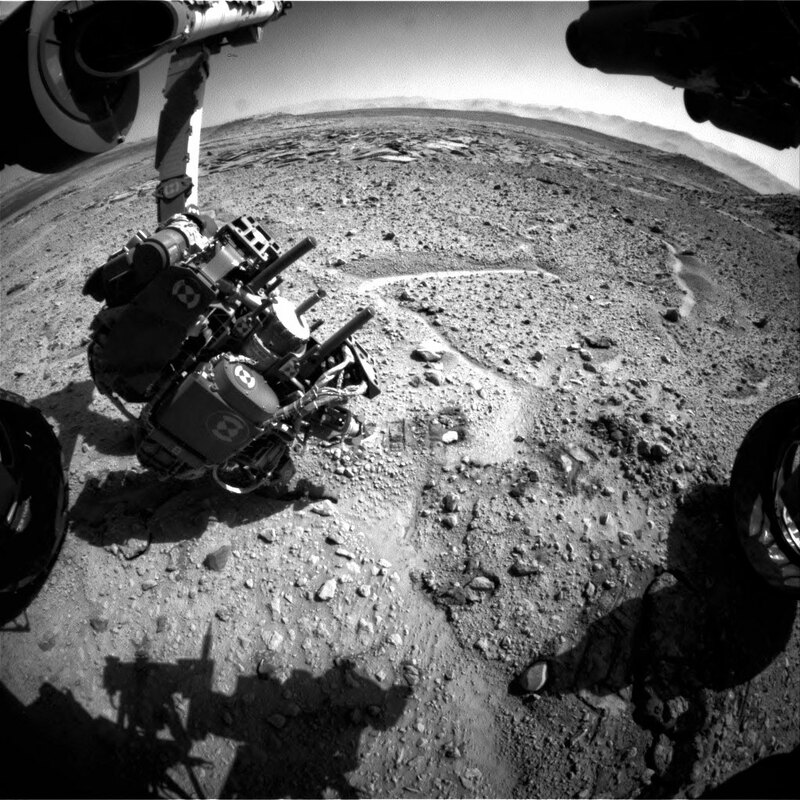 After their close approach to the middle unit on Sol 597 – 602, they backed up from the outcrop, getting their wheels back on sand. Then they drove south and picked their drill site. 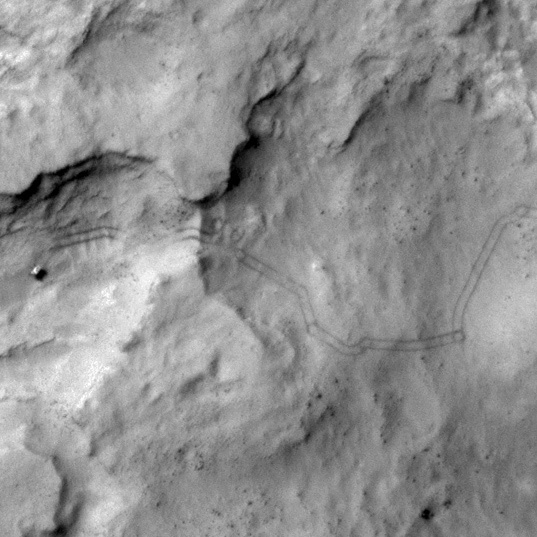 But before we get into the whole process with pictures of how Curiosity cleaned a rock and then drilled into it (and something else as a surprise), let me show you this incredible image of Curiosity, taken by HIRISE from orbit. I can’t stop looking at images like this one and to be fascinated with how humans have a 1-ton rover on the surface of another planet doing science. 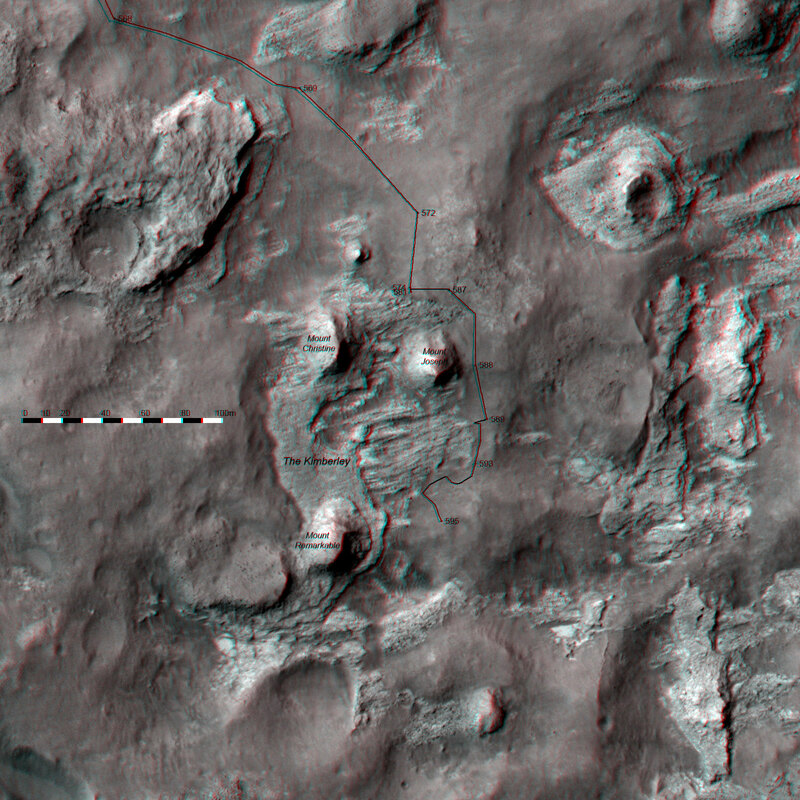 Even more amazing, have a look at the terrain in stereo! 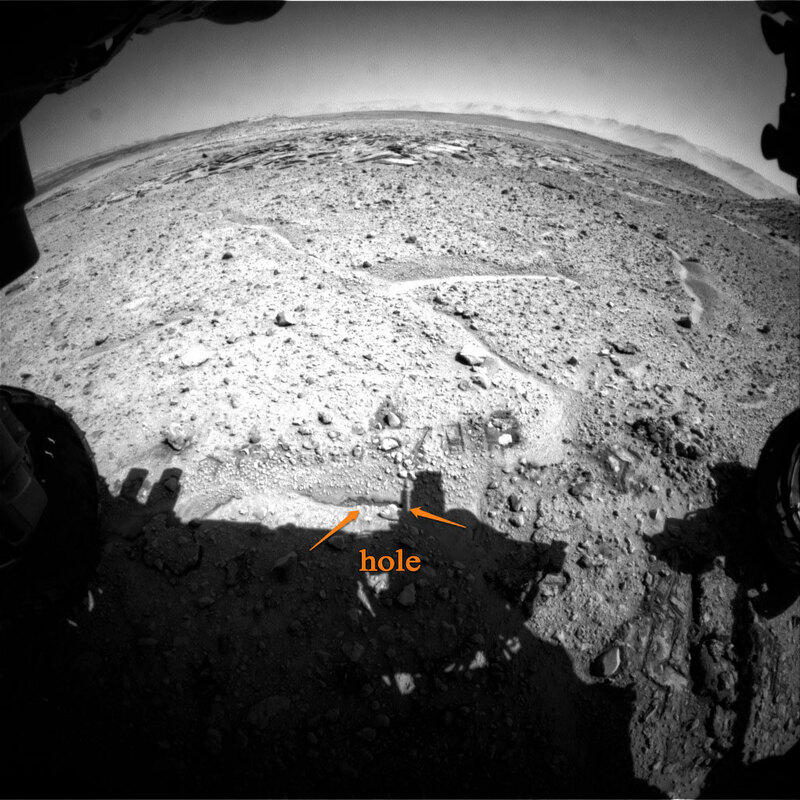 Here is a cool video clip that explains briefly what is Curiosity doing at Kimberley. So, I hope you are still here admiring! Instead of showing you all the updates from Ken Herkenhoff here for these sols, I will just show you the images that I have. On Sol 603 Curiosity had a drive toward potential drill site, with mid-drive imaging of alternate site in its schedule, then Sol 604 was wasted and then on Sol 605 MAHLI and APXS observations of a windblown soil target. 17 April 2014While most of the MSL science team met at Caltech to discuss recent results and plans for the near future, the tactical team planned a 65-meter drive toward the southeastern side of Mount Remarkable, near the site chosen for the next drilling campaign. The rover will pause in the middle of the drive to image the backup drill site, then acquire all the data needed to select contact science targets and bump to a drill site this weekend. Planning is restricted again, so untargeted science will be planned for Sol 604. 18 April 2014Thursday was the last day of the MSL science team meeting, and the discussion shifted from science results to analysis of wheel wear, both on Mars and on Earth. 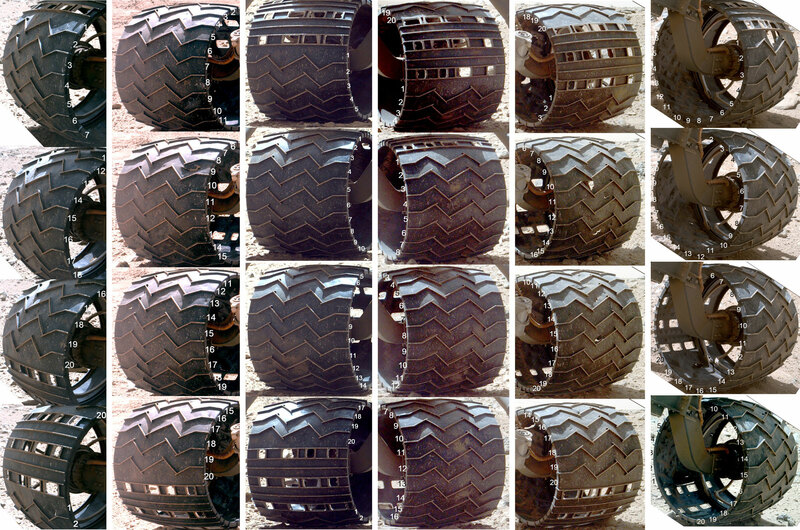 The engineers at JPL have done a lot of testing in the Mars Yard and compared the results with the many images of the wheels on Mars. Although these images show that wheel wear continues, the damage is accumulating at a lower rate due to the changes in traverse planning that have been implemented in the past few months. Driving over rough terrain appears to be the most significant threat to the wheels, and efforts to recognize and avoid hazardous terrain using data returned by Mars orbiters have allowed safer drive paths to be chosen. It was clear that the engineers are not as concerned about wheel wear as they were last fall, and that they do not feel that wheel wear will limit the lifetime of rover mobility. 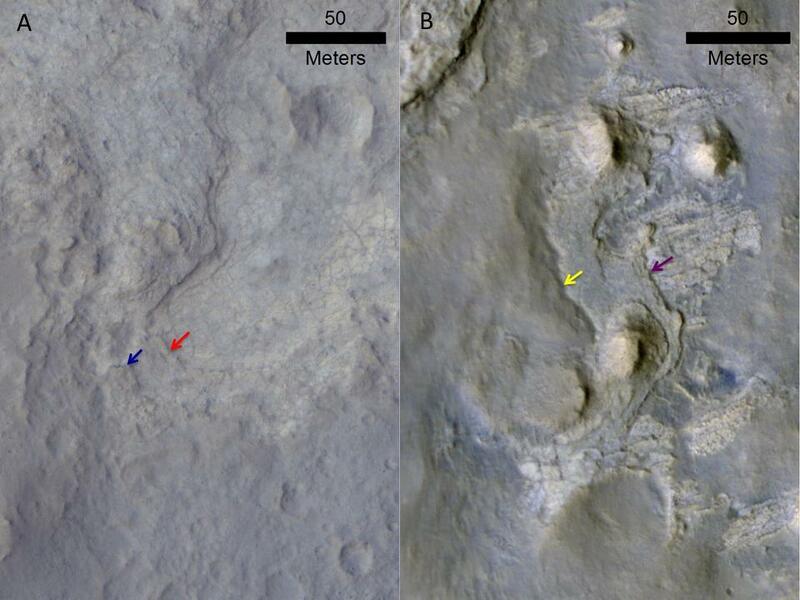 This conclusion was based in part on tests in the JPL Mars Yard that showed that even very heavily damaged wheels performed well in climbing rocky and sandy slopes. So, it’s time to drill! 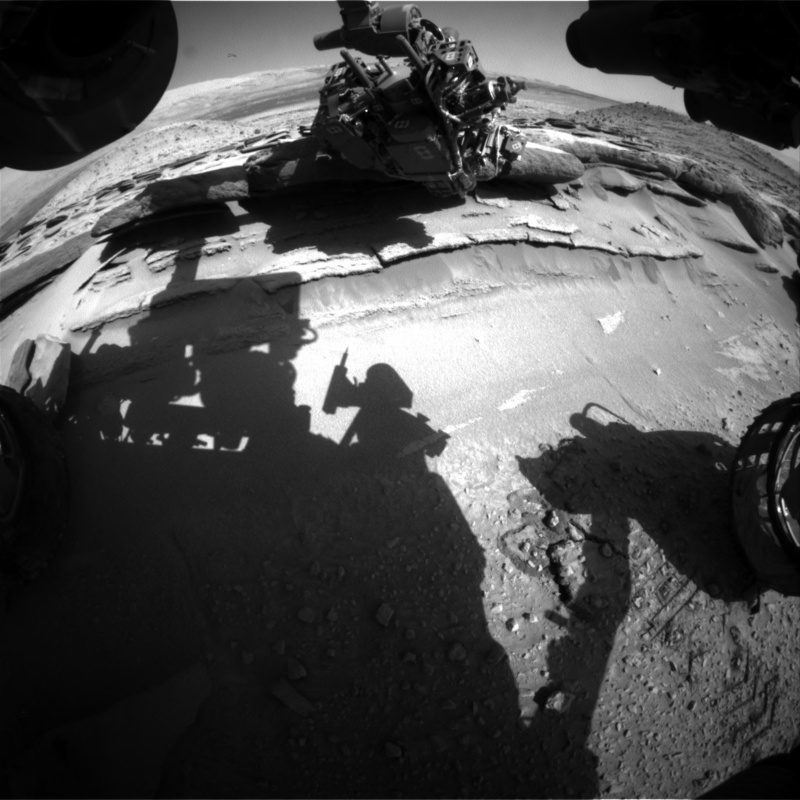 Curiosity has a tradition before drilling into a rock (and that happened only two times up to now) to take a selfie! 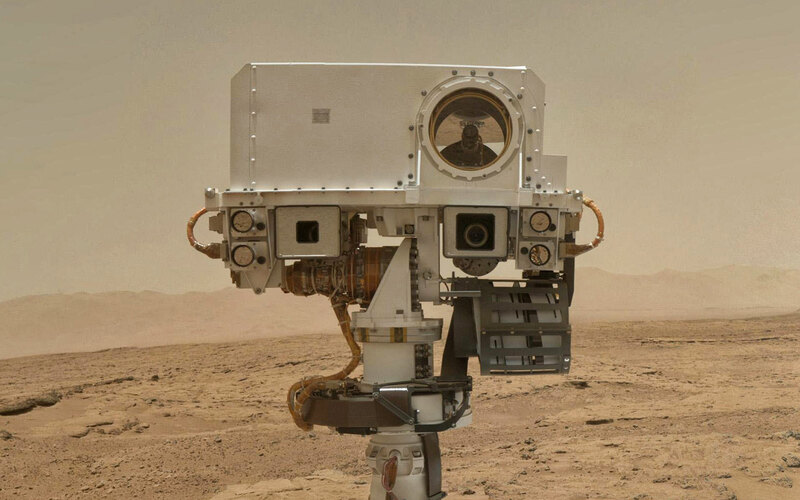 As you will see just now, the selfie fashion has spread even to Mars! And as a last great goodie for this update I fixed a small animation for you. This is a series of photos taken by Curiosity (on Sol 606 if I am not mistaken) at the night sky above Mt. Sharp in Gale Crater. You see the first asteroid seen from Mars. During the last month, Curiosity has been full throttling to go to Kimberley! In fact, she is already there, but one thing at a time! Curiosity has been driving every day between 559 and 569. MRO (Mars Reconnaissance Orbiter) had a safe mode situation for a few days, but mission control at JPL managed to relay data alternatively and the safe mode cost only one sol of driving lost. 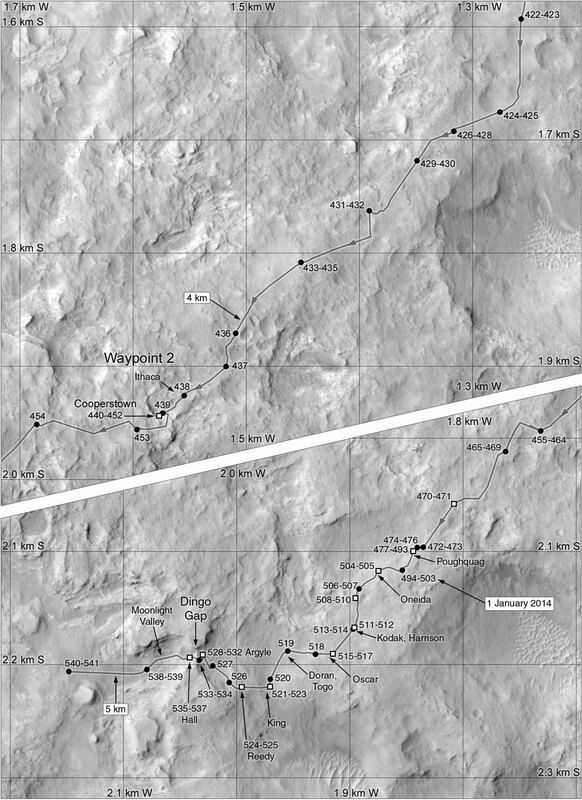 Here is a Route Map of Curiosity between 555 and 569. The upper image is taken by Curiosity on Sol 563 with a view back on where she has been driving – the Kylie outcrop – for the last week or so. During this period, the down-link from Curiosity for the day was slipping later and later with every day and they had a very little time to plan for the next day, so there were no science objectives during these days – only driving. 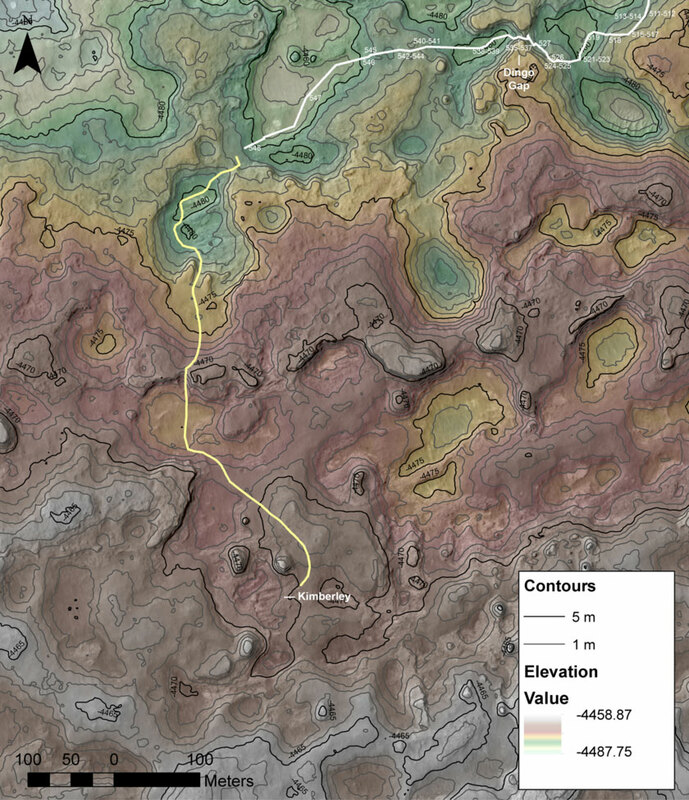 The rover drove 74 meters on Sol 568 and around 100 meters on Sol 569. Finally, on Sol 570, the Martian calendar slipped a full day against the Earth calendar and starting Sol 571 the mission started “restricted sols” for a while. 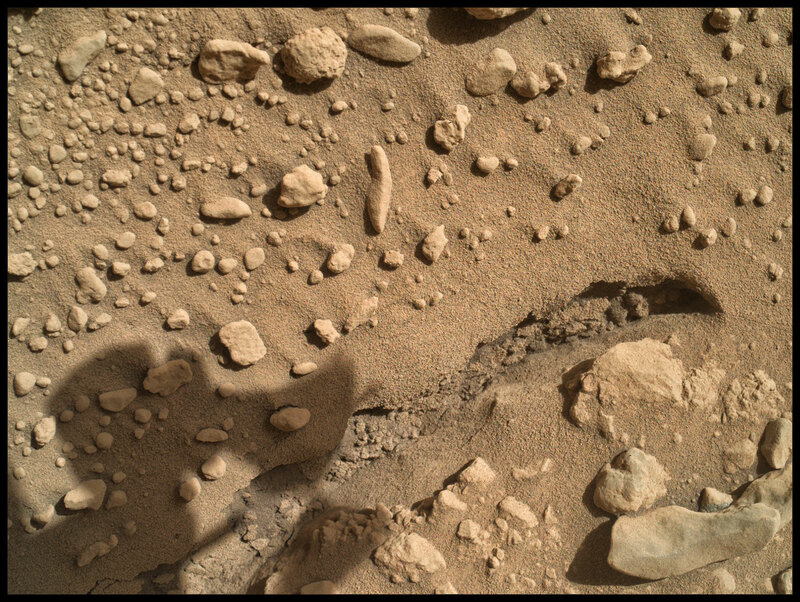 On Sol 569, Curiosity spied up front to Kimberley! There are 4 distinct hills on this image. The second from left to right is not a part of the Kimberley outcrop, it is closer to the rover. The other three are a part of Kimberley. 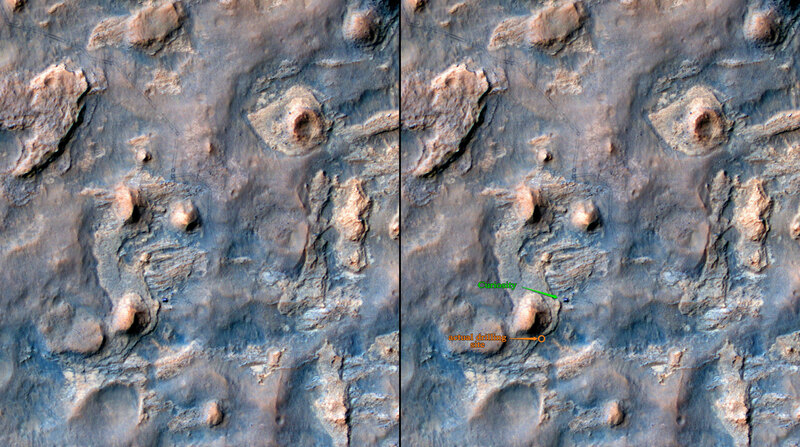 Curiosity will approach the outcrop from east (left on the image) and will visit the left most hill first. There is a very interesting looking outcrop there with dark shadows on the front. Before I continue, let me show you something very interesting that I found on my friend Emily Lakdawalla on her blog. I will post my own images like this one later, but let me show you this one as I am pretty excited about it! Check out our mighty Curiosity rover on Sol 538 on the surface of Mars shot by MRO’s HiRISE camera. 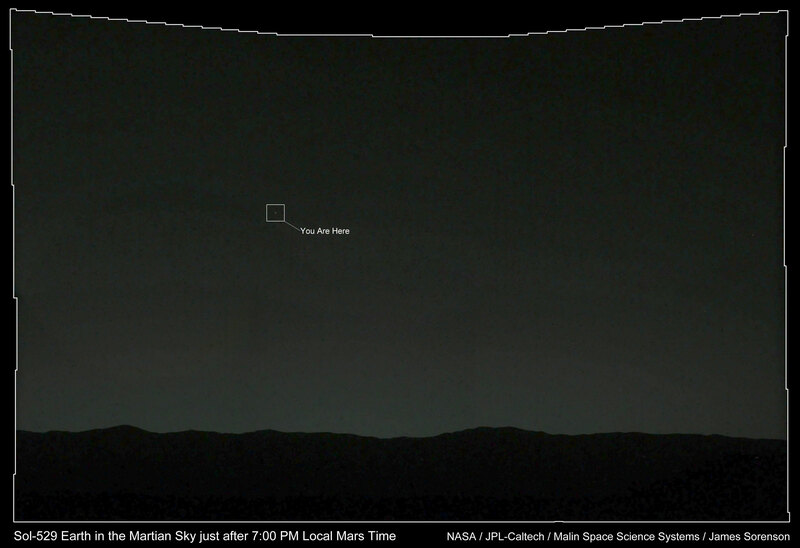 That dot there is our 342 kg (on the surface of Mars) rover!! On Earth, Curiosity’s identical twin, that JPL uses when they have to do something complicated or risky, weighs 899 kg! 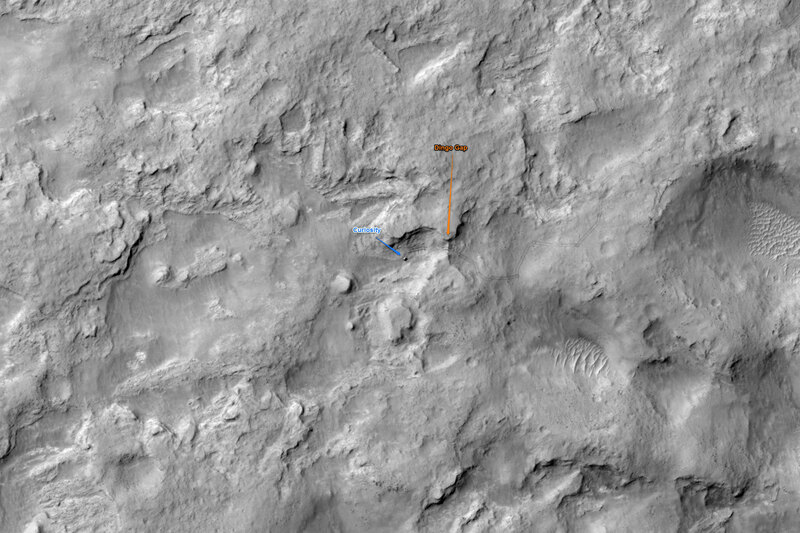 So, on Sol 570, Curiosity spotted Kimberley from a bit more than 100 meters. Kimberley is a unit where three types of terrain meet. The three hills of Kimberley are the top most layer, the other layer is the “striated” unit which can be seen even from orbit. It appears on stripes and is located primarily on the south-eastern part of Kimberley, but some of it is also visible in the north part of the outcrop and that is where our mighty Curiosity is headed! On Sol 572 and Sol 574 drove the distance to Kimberley and on Sol 574 it arrived there. On Sol 571 they made an APXS integration on the Curiosity’s observation tray. This measurement will be useful as a baseline when they put new material in the tray of the rover and such a measurement wasn’t done for almost an year now, so it was time. The observation tray is in the front of the rover’s trunk, so it is at a convenient viewing place for all cameras and for the robotic arm. 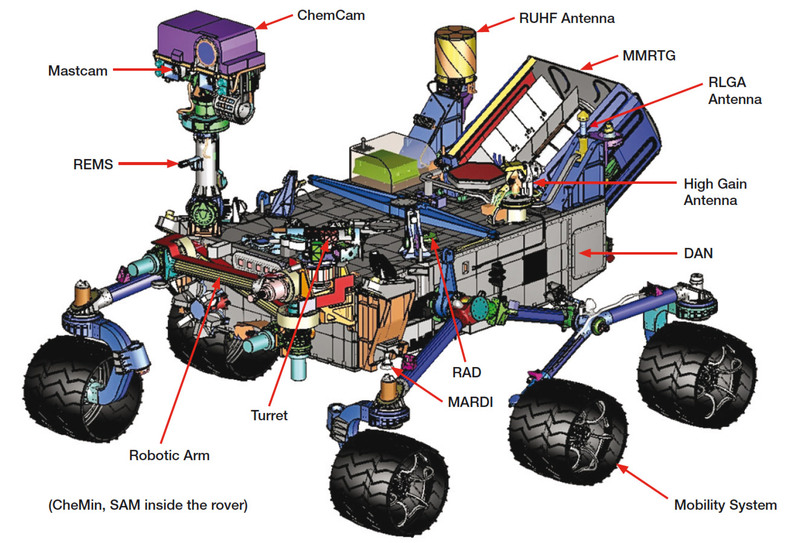 By the way, if you want to know a little more about the science instruments that Curiosity has, check out this image. On another note, scientist Ken Herkenhoff posts almost daily updates on the activities that Curiosity does every sol. You can check them out here. 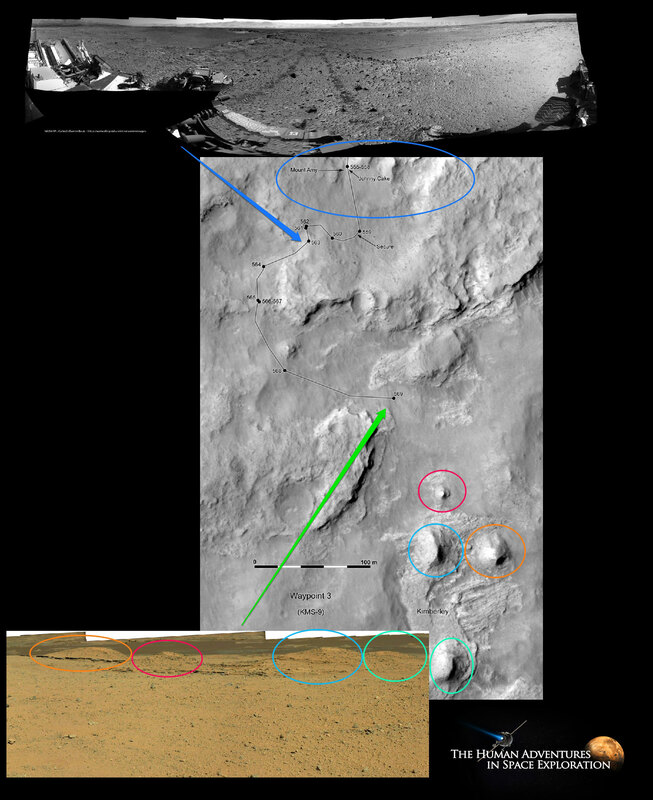 The Sol 574 post-drive images show nice outcrops in front of the rover, suitable for contact science. This image shows the favored rock face for contact science at upper left. The Sol 576 plan starts with a ChemCam observation of this rock face, plus a Mastcam stereo mosaic of the outcrop. 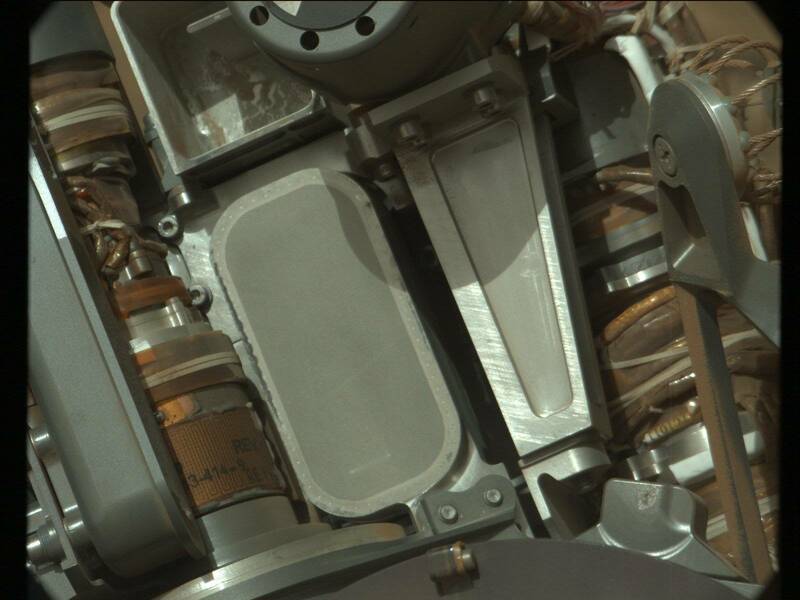 Then the arm will be deployed to “thwack” and vibrate CHIMRA to clean out any remnants of the “John Klein” sample, followed by Mastcam and RMI imaging of the CHIMRA sieve. After stowing the arm, the rover will bump about 2.7 meters toward the outcrop and take the data needed to plan contact science this weekend. Again, check out the link above to see what is ChemCam and CHIMRA. 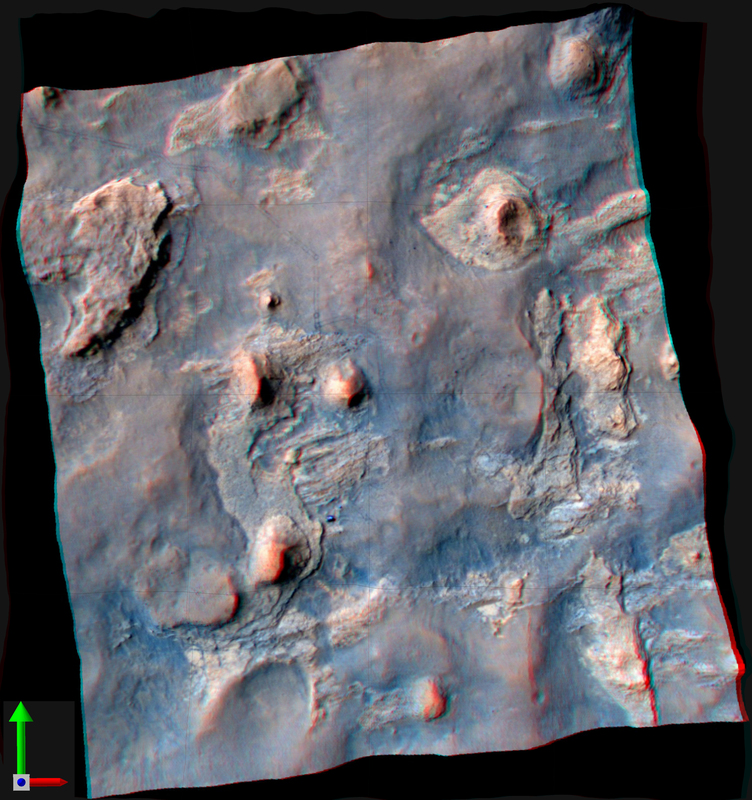 And here is a stereo view of the north part of Kimberley in case you have 3D glasses around and you want to be amazed of the feeling to be actually on Mars. 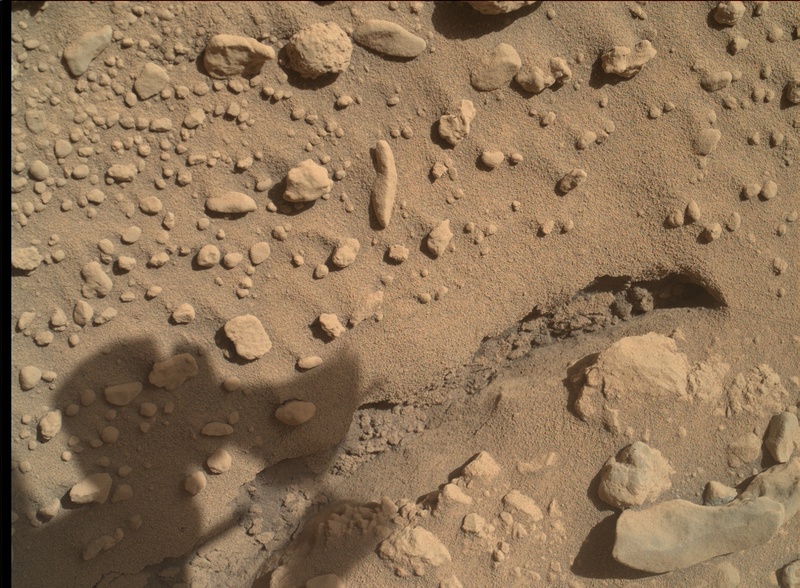 Here is an image of the interesting rock that ChemCam’s RMI shot and the colorized Mastcam data on top. NASA issued some news on Kimberley on March 24 and you can read them here, but I will try to summarize things here with my limited knowledge. Basically they think that all rocks around Kimberley appear to be sandstones, but then why do they look different? The material that fills the space between the the smalls grains of sand is called cement. Cement can have different characteristics, depending on the environmental history of the affected rock. For example, sandstones will clay-mineral cement are much much softer and breakable than sandstones with cement made of quartz. The major issue to understand now is why some of the rocks differ from others and resist more erosion. This is the motivation of science team to investigate at Kimberley! They will not be able to answer that question with cameras or even with the APXS instrument on the arm. The APXS can tell them what elements are present in the rock, but not the minerals, and it’s the mineral information we need in order to answer the cement question. For mineralogy, we need SAM and Chemin, and that means drilling. So, it’s time to drill! This means that they first have to prepare for drilling. As we said earlier (Ken Herkenhoff’s quote) they did an activity called “primary thwack” which is basically knocking CHIMRA’s sieve on its top to remove any residual material left from John Klein that may be stuck in its holes. They have a suspicion here that they might have problems with the weld edges of the sieve that may be a little detached from each other and this might be a cause for a serious problem later on. They took many images up close of the problematic sieve. 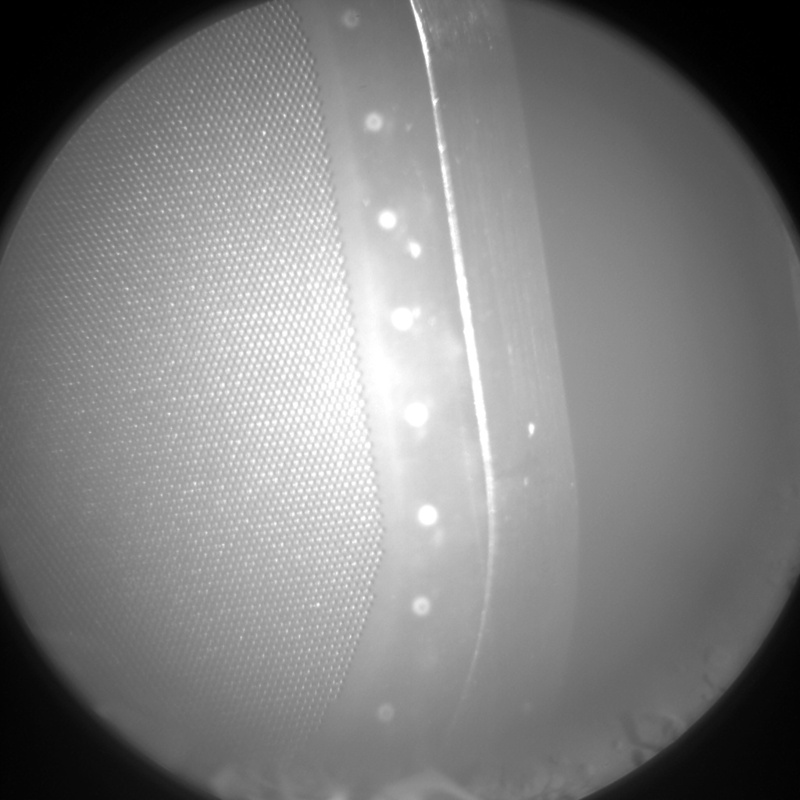 The rover also has a couple of arm faults happening on Sol 576 and Sol 578. Arm faults happen when the rover thinks that something bad might happen to its equipment if it does what it is commanded to do. This is different from a rover safe mode, where something bad actually happened and the rover is in emergency mode, waiting for a fix. Anyway, the faults were of known issues and everything is healthy and in business! So, on Sol 583 Curiosity placed her robotic arm for the first time on Kimberley, checking out with MAHLI and APXS at the end of the arm. MSL planning is still restricted on Sol 584. On another note, Curiosity’s wheels are in a fine state for now. The pace at which new holes have appeared in the wheels during recent drives is less than one-tenth what it was a few months ago. Activities with a test rover at JPL this month show that wheels with much more extensive damage than has been sustained by any of Curiosity’s six wheels can still perform well. The holes in Curiosity’s wheels are all in the thin aluminum skin between much thicker treads. These tests on Earth are using wheels so damaged that many treads are broken, but they still provide traction. Curiosity has been traveling to its scientific target Kimberley – an exposed outcrop where scientists are hopeful to do contact science and a drilling campaign. 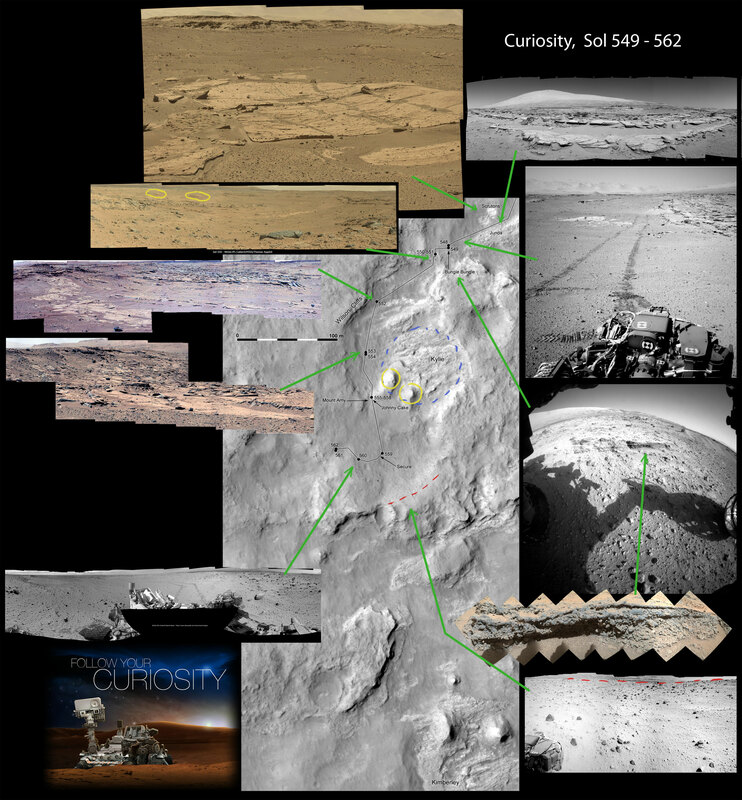 Here is Curiosity’s road map and some views of the places which she visited. While driving on Sol 548, Curiosity took some photos of outcrops called Scrutons and Junda. You can also see a stereo image of Junda here. On Sol 549, Curiosity arrived to an outcrop called Bungle Bungle and made measurements with MAHLI and APXS. On Sol 550, it made zapped the outcrop with its laser and took this wonderful image (have a look at the large version – it is so beautiful). Bungle Bungle seems to be composed of chunks of rocks of different sizes. They are sort of roundish, but not quite. This means that they haven’t traveled a long distance (in water) before being deposited in this outcrop. The most probable explanation is that sediments were deposited and water dumped a bulk of small rocks into the place that we see now. 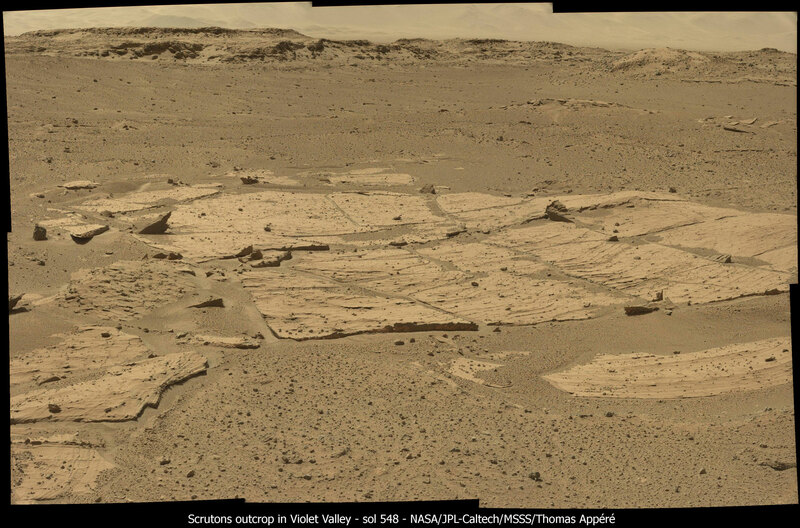 Then, on Sol 550, Curiosity entered the valley where Kylie resides. 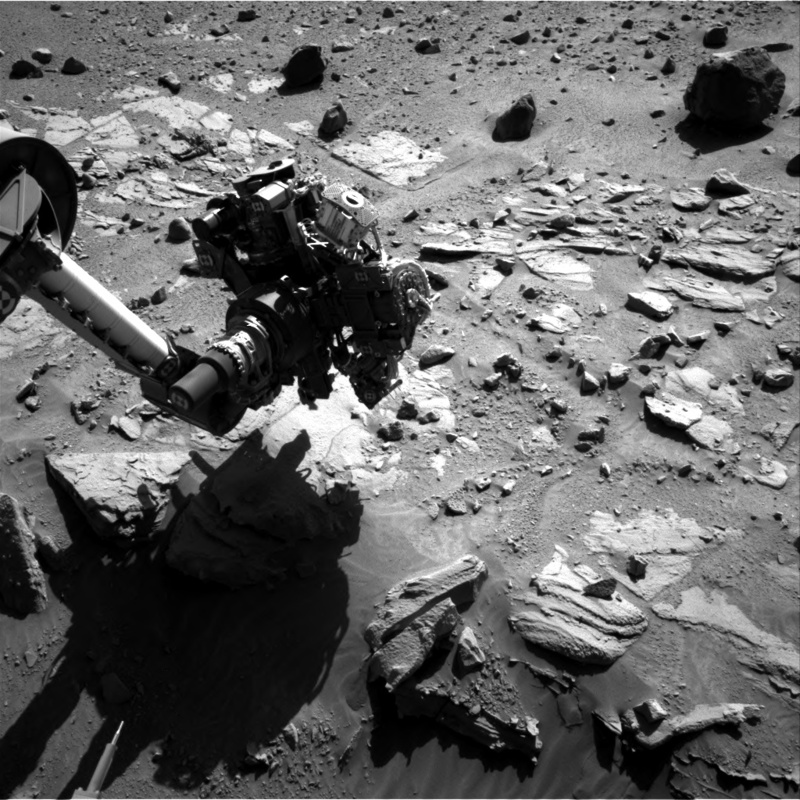 … then another long drive on Sol 553 and another shot of Kylie, this time west of it. This striated outcrop (Kylie) is made of some kind of laminated rock which layers are slightly tilted. On Earth such tilted layers can appear if they are flat and then as a result of tectonics they get tilted. This can’t happen on Mars. Another two options are first, this tilted layers to have been created by wind and the second, if a river’s delta drops its sediments outwards in tilted beds in a way that looks superficially similar to windblown sand. On Sol 555, they departed Kylie. On Sol 557 Curiosity did some SAM combustion experiments and they need a lot of power so there were no daytime activities scheduled. The latest of these activities finished in the morning of Sol 558, then Curiosity did some Mastcam and ChemCam observations of a target called “Mount Amy”, then MAHLI and APXS observations of a target called “Johnny Cake”. On Sol 559, Curiosity took this photo of its road ahead and unfortunately it is not the kind of terrain that it is best for its wheels so it headed west (right) to go around it. You can also see that the horizon is very near on this image meaning that after that there is a steep slope that may prove to be dangerous! 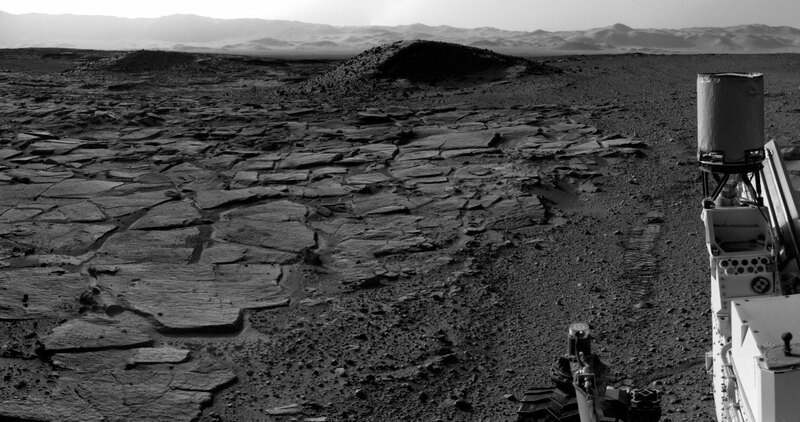 So, instead of driving straight through the rocks, Curiosity headed west. This is an image Curiosity took on Sol 561 on the entrance of the next valley (the middle of the image). Curiosity added backwards driving to its arsenal of activities checked out! The rover drove already 285.5 meters since it crossed the dune called Dingo Gap on Feb. 9. Curiosity drives over a confirmed more benign terrain from orbital imagery. There are fewer sharp rocks, many of them are loose, and in most places there’s a little sand cushioning the rover. Its total odometer now stands at 5.21 km. 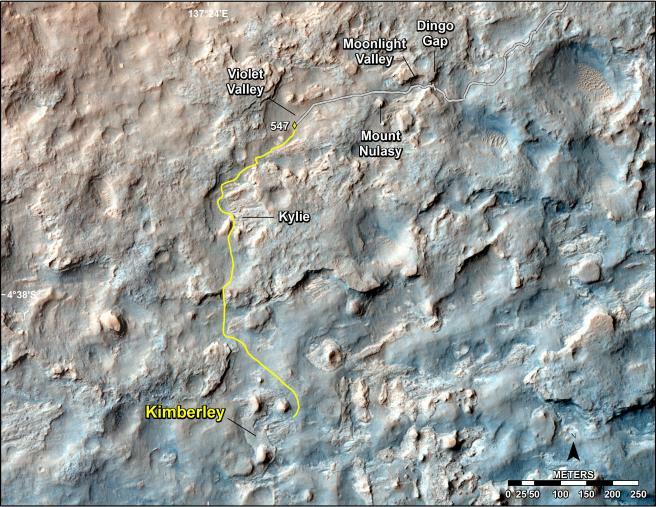 The main mission of the rover remains the same: a science waypoint called Kimberly (about 1.1km away) where Curiosity will most likely use it’s drill for a third time and then longer-term goal investigating the lower slopes of Mt. Sharp, where water-related minerals have been detected from orbit. 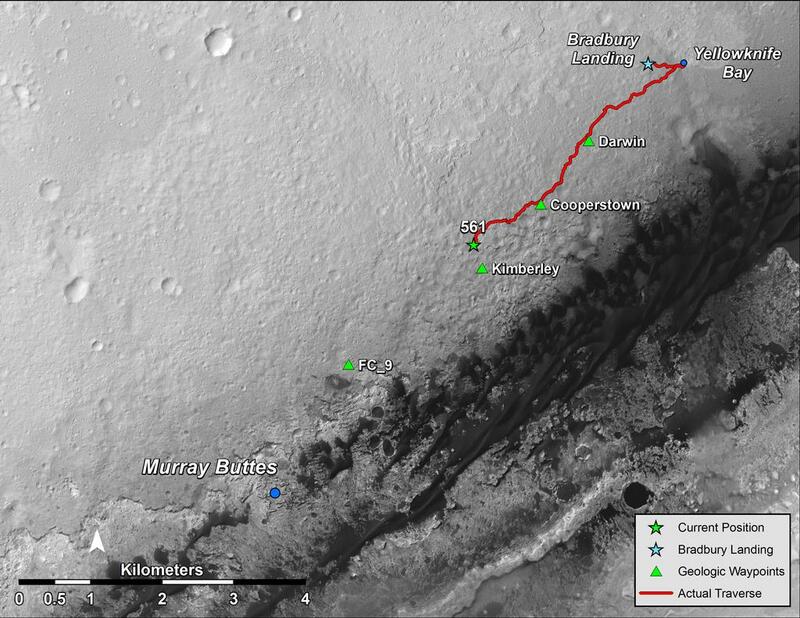 On Sol 540 Curiosity reached the 5 km mark on its journey on Mars just after it drove over the Dingo Gap dune! Curiosity was making daily fast drives on auto-nav-drive until sol 472 when Mission control at JPL noticed that the wheels of the rover started to wear out very quickly. Wear and tear was expected, but the rate at which it happened was unexpected. The main reason for this are the winds on Mars that turn small rocks to small sharp pointy pyramids and when the heavy Curiosity (more than 300 kg on Mars) drives over them, punctures and tears appear on the titanium – aluminum wheels. This is the reason why the team at JPL decided to take the more benign, so called “pink route” which is not the shortest to Mt. Sharp. The team created a map of every wheel and after each short daily drive, wheels are monitored on a daily basis. Now the rover is driven by the so-called “blind driving” method and the first such drive after Dingo Gap was 75 m which is a big distance considered the method. Curiosity is looking for a fairly recently exposed bedrock that appear everywhere in the area, but the rover has to choose a smooth terrain to get to those exciting points where she will contact science and possibly a drill. 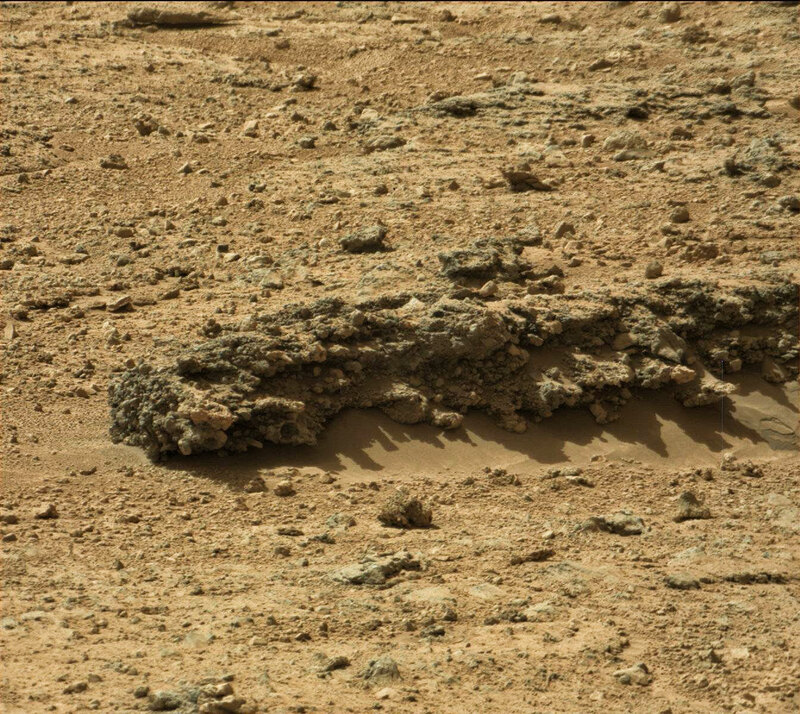 After crossing the Dingo Gap, Curiosity found some fins of materials protruding from the rock. These are places where fractures within the rock were filled with a material precipitating out of groundwater. Since the fill formed, the rocks have been eroding due to wind. The rocks are less resistant to erosion than the fracture fill, so the fracture fill now stands up higher than the rock itself. The rover deployed its arm to use the APXS and MAHLI instruments to study these veins. And here is a short very interesting story just so you can get a sense of how complex Curiosity mission is and how many things have to be taken in mind so that everything goes on plan. Curiosity uses has 3 antennas with which it communicates with orbiters around Mars and with Earth. It uses its UHF antenna for downlink meaning that it sends data to orbiters around Mars and they in turn send it to Earth. That’s downlink! 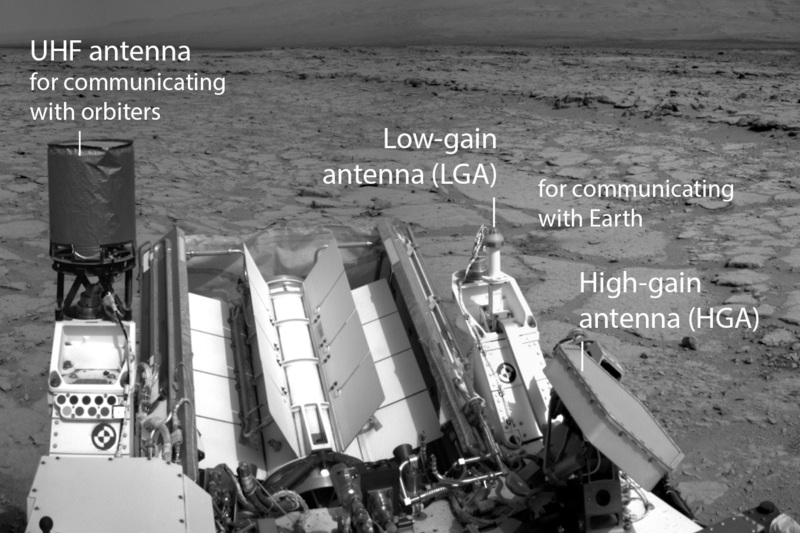 Curiosity, however, receives commands from Earth directly through its High-gain antenna (or the HGA)! This receive of commands usually happens in the morning local time, the HGA has to be able to “see” Earth on the Martian sky. Earth rises on the Martian sky in the east. The mission is currently in such a state that Earth rises relatively late on the Martian horizon. Meanwhile the HGA is located towards the middle of the rover, and is occluded when pointing rearward (at low angles) by the UHF, the LGA and the RTG (Curiosity’s power supply). Because Curiosity drives southwest, requires sometimes to turn the whole rover on place, so that communications are possible with Earth. Now, driving UP the Dingo Gap dune, the team first drove west. This “lowered” the rear part of the rover , or “raised Earth” making the HGA situation better. However, driving DOWN the dune towards the west, had the opposite effect and this was the reason why the communication window had to be delayed for later the day. On Jan. 30, Curiosity reached a 1 meter high dune surrounded by two scarps. The team is deciding whether to cross the dune. Curiosity needs to keep its wheels from punctures, that’s why the mission team are investigating routes that have less sharp stones. 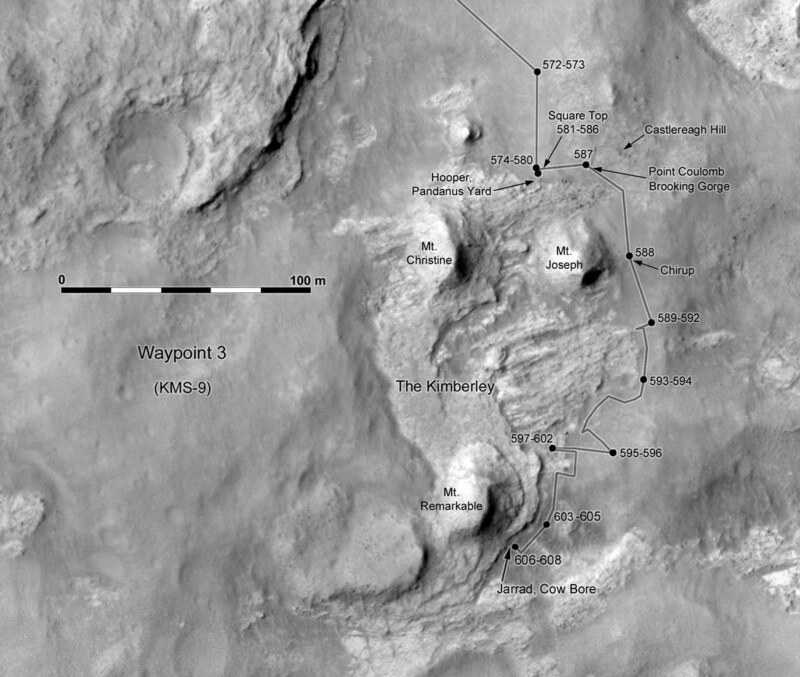 Based on analysis of images from orbit, the dune’s location called “Dingo Gap” was assessed as a possible gateway to a favorable route for Curiosity’s next traverse to the base of Mt. Sharp. 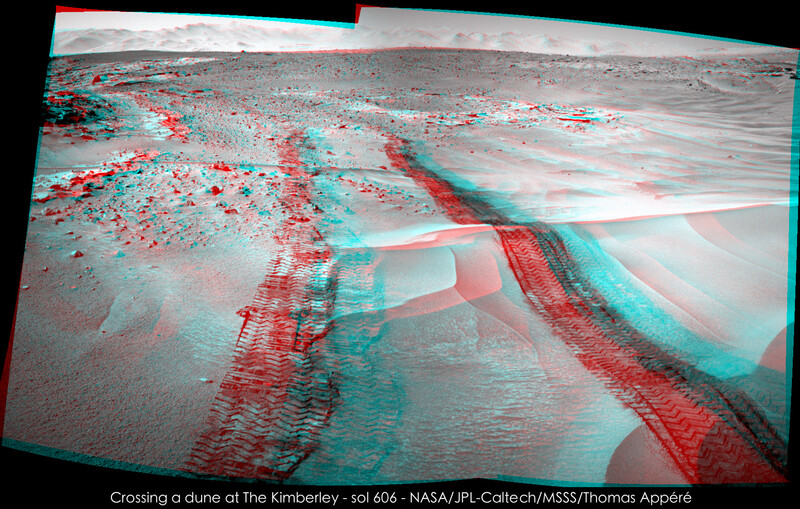 This is a stereo image made by Curiosity’s Mastcam. An this is a full rez image of the area. UPDATE: Curiosity has passed successfully through the “Dingo Gap” sand dune and now is on its way on a smoother route to Mt. Sharp. Previous PostTesla Model S Commercial by America’s StartupNext PostStand Up for Space!